This one’s inevitable, isn’t it. What reader can resist a novel about other readers, or if you’re an old bookseller like me, about booksellers? They’re an anorak’s delight. There’s a librarian in the mix, too, albeit it a rather eccentric one. Here are five books about books, then, the first two with links to a longer review. Set in the near future, Robin Sloan’s Mr Penumbra’s 24-Hour Bookstore playfully meshes the old reading world with new technology in a quirky edge-of-your-seat story of bookish folk. Clay Jannon works the night shift at the eponymous book store, logging its few customers, most of them oddly attired and in an urgent, distracted state. Curiosity aroused, Clay sets about unravelling the puzzle of the Broken Spine, the society to which all the shop’s customers belong, in a story that encompasses a fifteenth-century sage, extreme Google geekiness, the search for immortality and a bit of consternation about cassettes (remember them?) all served up with a good deal of humour. I loved it. Charlie Hill’s Books lampoons everyone in the book trade, adding a swipe at performance artists for good measure. It begins in Corfu where Lauren, a professor of neurology, and Richard, an independent bookseller, both witness the sudden death of a woman reading a manuscript by bestselling author Gary Sayles. As Spontaneous Neural Atrophy Syndrome spreads, Lauren seeks Richard’s help in investigating it. Meanwhile, preparing for the launch of his new novel, Sayles is suckered by two performance artists and the People’s Literature Tour is born. Liberally scattered with book titles, authors’ names and in-jokes, Books combines the humour and pace of Jasper Fforde’s fiction with the satire of Channel 4’s Black Books. I’m sure some of you will remember Carlos Ruiz Zafon’s The Shadow of the Wind, a bestseller set in Barcelona’s ‘cemetery for lost books’ where, aged ten, Daniel finds the book that will intrigue him, bedevil him and ultimately shape his life – The Shadow of the Wind by Julián Carfax. On his sixteenth birthday, Daniel sees a stranger smoking a cigarette from his balcony, instantly recognising a scene from Carfax’s novel. I read this for work expecting to grit my teeth as it was a much-hyped flavour of that particular month but I loved it. Both gripping and very atmospheric. Delving back into reading past, Sheridan Hay’s The Secret of Lost Things is a booky highlight. It’s set in the Arcade, a rambling New York bookshop – suspiciously like the legendary Strand – staffed by a bunch of eccentrics who are joined by eighteen-year-old Rosemary, fresh from Tasmania. When she opens a letter offering a ‘lost’ Melville manuscript the fun begins. Hay’s novel is an appealing, enjoyable yarn of thwarted love and literary detection. Not a literary triumph, but it had me engrossed. And now to that librarian. She’s the protagonist of Sophie Divry’s The Library of Unrequited Love who finds a young man locked in the library overnight – surely a bibliophile’s dream – and treats him to a passionate, if slightly scolding, soliloquy about her colleagues, the Dewey Decimal system and bookish conspiracies while unwittingly spilling the beans about her yearning for a young researcher. A thoroughly entertaining, if quirky, read which led me to Divry’s much more conventional Madame Bovary of the Suburbs. Any novels about books you’d like to recommend? This entry was posted in Five Books I've Read, Reviews and tagged Black Books, Books, Carlos Ruiz Zafon, Charlie Hill, Lucia Graves, Mr Penumbra's 24-Hour Bookstore, Robin Sloan, Sheridan Hay, Siân Reynolds, Sophie Divry, The Library of Unrequited Love, The Secret of Lost Things, The Shadow of the Wind on 6 August 2018 by Susan Osborne. 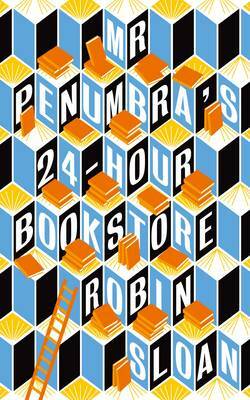 Robin Sloan’s Mr Penumbra’s 24-Hour Bookstore was a 2013 favourite for me. I’ve been waiting patiently for something else from him having been a little disappointed by Mr Penumbra’s prequel, Ajax Penumbra 1969, and was delighted to spot Sourdough on the January horizon. It’s the story of a young woman who is given a sourdough starter, so hungry it may take over the world. Just a year out of college, Lois lands a plum job in San Francisco helping to design the perfect robotic arm but it’s far from the dream she envisaged. Her nose firmly to the grindstone, her stomach cramped with stress, she exists on a diet of Slurry, the convenient nutritive gel championed by her boss. One day she finds a flyer advertising spicy soup and bread stuck to her apartment door. Desperate for comfort, she places her order with a friendly young man and another delivers it. Soon she’s addicted to their lip-smacking produce but Beo and Chaiman are moving back to their parents in Edinburgh. Before they go, Beo gives Lois his sourdough starter with instructions to play it the background music she’s familiar with from her nightly orders, and an email address. Lois, of course, has no clue how to bake bread but she knows how to set about learning. Soon she discovers there’s more to life than robotics, setting up a small sideline selling bread to General Dexterity’s trophy chef who suggests she auditions for a coveted stall at a farmers market. There she meets a young woman who offers her a place at a market no one else seems to have heard of where all manner of weird and wonderful food is being developed. Sourdough is just the thing to brighten up a dull winter evening. Lois is an engaging narrator, determined to find a way to make her new hobby pay enough to liberate herself from the grind of her day job, and there’s the promise of a tentative love story threaded through Beo’s emails. A few well-aimed swipes are taken at the modern world which seems either to have lost its taste buds or to have become obsessed with them and is unable to find a middle way. And who can resist a novel whose star is a megalomaniac sourdough starter that puts on a light show, sings to itself and is kept in check by Grateful Dead tracks. A thoroughly enjoyable piece of entertainment which, like Mr Penumbra’s 24-Hour Bookstore, has something to say about the way we live – and eat – now. This entry was posted in Reviews and tagged Ajax Penumbra 1969, American comic fiction, Atlantic Books, Food in fiction, Mr Penumbra's 24-Hour Bookstore, Robin Sloan, Sourdough on 12 January 2018 by Susan Osborne. This is the first book I’ve read by André Alexis. His last novel was narrated in the voices of its titular dogs which brought back memories of Paul Auster’s Timbuktu, and not happy ones. That said Fifteen Dogs went on to win the Scotiabank Giller prize in 2015 so what do I know? This latest novel is entirely different: a funny, clever and intricately plotted piece of storytelling full of puzzles within puzzles involving an honourable thief, a rich beyond imagining junkie and a treasure hunt. Tancred Palmieri is a complex character brought up by a single mother whose deathbed wish was that he change his thieving ways. He’s known Willow Azarian for a little while. She’s a junkie, drawn to telling Tancred her story, impressing upon him that she’s an heiress and eventually presenting him with an intriguing challenge. Her stupendously rich father has left each of his five children a memento, something which is of particular significance to them. Willow’s is a beautiful facsimile of a Japanese screen, one panel left blank but for an inscription. She’s convinced that her father has set a puzzle which can only be solved by examining all the artefacts together. Tancred is to steal each one, quietly returning the item once Willow has scrutinised them all. He will, of course, be recompensed. Reluctantly, Tancred agrees and has hardly begun his exacting task when Willow dies. Having given his word, Tancred has no choice but to continue only to find that his best friend is the detective investigating the burglaries and his bête noir, Willow’s dealer, has got wind of what he’s up to together with the reward it might bring. As each piece of this elaborate puzzle painstakingly slots into place, another mystery opens up until finally Tancred is left face to face with himself. This is a hugely enjoyable novel, a good old-fashioned caper which twists and turns in a baroque fashion as its many conundrums are unfolded. It’s very funny at times – Castle Rose whose designer took his inspiration from M. C. Escher is a particular delight. Alexis excels at elaborate yet flawless plotting, smoothly switching perspective from character to character. The book’s premise reminded me of Scarlett Thomas’ The Seed Collectors and its style of Robin Sloan’s Mr Penumbra’s 24-Hour Bookstore, both favourites of mine. If there’s any disappointment at the resolution its matched by Tancred’s own and offset by the development of his character. Altogether a delight – packed full with colourful detail and characters, each with a story to tell or be told, and funny with it. I think I should try Fifteen Dogs after all. This entry was posted in Reviews and tagged André Alexis, Canadian Fiction, Mr Penumbra's 24-Hour Bookstore, Robin Sloan, Scarlett Thomas, Serpent's Tail, The Hidden Keys, The Seed Collectors, Toronto on 30 August 2017 by Susan Osborne. Hard to beat the satisfaction of reading a book you’ve been looking forward to for months and finding it to be even better than your sky high expectations. I’ve been eagerly anticipating Mr Penumbra’s 24-Hour Bookstore ever since I spotted it in Atlantic’s catalogue way back in January. Set in the near future, it playfully meshes the old reading world which most of us still inhabit with new technology in a quirky edge of your seat story of bookish folk. Unemployed thanks to a downturn, techno savvy Clay Jannon finds himself working the night shift at the eponymous bookstore. It’s just him behind the till – Oliver does evenings and Mr P takes the day shift. But this isn’t any old bookstore: Clay must log both the physical appearance and demeanour of the few customers that come through the door, most of them eccentrically attired and in an urgent, distracted state. Finding the ornately bound esoteric books they request is something of a challenge and involves climbing ladders up stacks reaching to the equivalent of three floors. When he looks inside one of the books and finds an impenetrable jumble of characters Clay’s suspicions are aroused. He sets about unravelling the puzzle of the Broken Spine, the society to which all the shop’s customers belong, accompanied by his beautiful new girlfriend – a rising Google star – his special effects genius roommate and his nerd-turned-millionaire best friend. To reveal too much of the story would be to spoil the delight of discovery but suffice to say that it encompasses an ancient secret society, puzzle upon puzzle, a fifteenth century sage, extreme Google geekiness, the search for immortality and a bit of consternation about cassettes (remember them?) all served up with a good deal of humour. Erin Morgenstern is quoted as saying it was the first book that made her cry in 2013, and there’s a point at which I defy any reader not to feel tearful. It also has a happy ending so I will be handing it over to H who has just about been keeping his covetous mitts of it and for whom unhappy endings are to be avoided. This entry was posted in Reviews and tagged Atlantic Books, Mr Penumbra's 24-Hour Bookstore, Robin Sloan on 9 August 2013 by Susan Osborne.